Region de Murcia International Airport (IATA code: RMU and OACI code: LEMI), also known popularly as Murcia-Corvera Airport or Murcia Airport, is located in the Autonomous Community of the Region of Murcia, between the towns of Corvera and Valladolises, located 25 kilometers south of Murcia city, and 25 kilometers north of Cartagena city. The airport is owned by the Autonomous Community of the Region of Murcia. However, the management, operation, maintenance and conservation of the airport is carried out by the company Aena SME, S.A by means of a concession contract. The airport is scheduled to open on January 15, 2019, and was built in order to replace the Murcia-San Javier airport, an airport also located in the same region but smaller and that had practically reached the limit of its operational capacity. The airport is closed at night, both in winter and in summer, from 10.30pm to 07.30pm. The traffic of the airport is mainly international, being its main destinations the United Kingdom, with a very high percentage of passengers, and Norway. Due to this great influx of international traffic, the labeling of the airport is available in Spanish, German and English. The airport has the capacity to manage 2,030 passengers per hour, with a maximum of 3.5 million passengers per year in 23,000 operations per year. Address: Avenida de España nº 101 || 30154, Valladolises y Lo Jurado (Murcia). The lost property office of the passenger Terminal is located on level 0, check-in hall. Ryanair: 00 44 871 246 0011. Swissport Handling: 667 545 032. The airport has the IATA code: RMU and the ICAO code: LEMI. 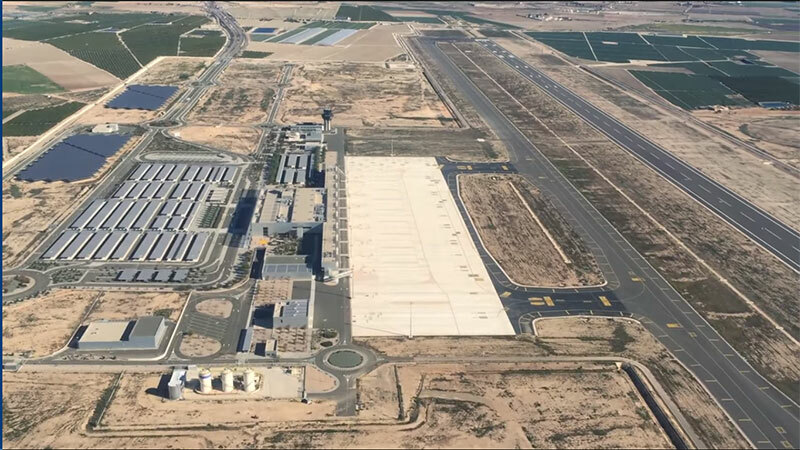 The Murcia airport currently has a single runway heading 05/23, de 3000x45 meters long (98433x148 feet) at an elevation of 193 meters above sea level. The runway is equipped with ILS / DME CAT I precision instruments for poor visibility approaches, and non-precision support instruments DVOR/DME. The airport has a single passenger terminal building with two floors and a cargo terminal. Murcia-airport.net offers information to the visitors, related to the Murcia airport, but has no direct or indirect connection with AENA, the administrator of the biggest part of the Spanish airport network. For further explanations about flight schedules, connections, Immigration services, airlines and/or luggage, please contact to the following phone number: (+34) 968 36 23 75. If you wish to contact Murcia-airport.net, please send your message to murciaairport@aeropuertosenred. If you wish to advertise yourself on billboards within or outside the airport premises, please contact airlinebox@aena.es. How to get to & from Murcia airport by bus: urban, suburban and large distance bus transport. Information about Murcia city taxi service. Stands and tariffs at Murcia airport.